Ancient Romans or Greeks are traditionally considered the inventors of concrete. They made concrete from lime, volcanic sand and ash, small stones, and water. Romans used concrete extensively in structures such as the Pantheon, the interior of the Coliseum and aqueducts. In 1824, an English inventor named Joseph Aspidin invented a style of cement, a modified form of which is still the dominant type in construction today. It was made of powdered limestone and clay mixed with water. Reinforced concrete, which includes embedded metal, was invented in 1849 by Joseph Monier. 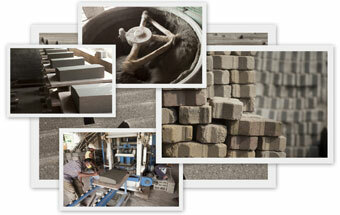 In 1868, the Frear Stone Manufacturing Co. of Chicago began manufacturing G.A. Frear's patented concrete blocks with decorative trim, less expensive than carved stone. This was the first commercial manufacture of concrete block, and many of these blocks survived the 1871 Chicago fire. Improvements to Portland cement revolutionized the concrete industry in the early 1900s. This cast-iron machine constructed hollow concrete blocks and made widespread production possible. Now, scientists at Massachusetts Institute of Technology are studying whether the Egyptians might have used concrete blocks in the pyramids. If so, this would change the entire accepted history of engineering. Concrete would have been invented at least 2,000 years before it has traditionally been thought.